We compare the usability of the locomotion technologies on the VR environment to propose a more suitable technology using a VR adventure game created by us. 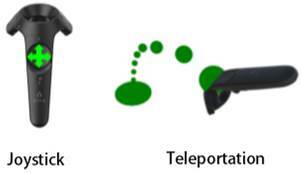 Joystick (JS) and teleportation (TP) are the basic locomotion technologies on VR and can expand a limited space. For the study, we have subjects play a VR game to which the two locomotion technologies are applied and compare and evaluate the usability of them using Simulator Sickness Questionnaire (SSQ) and Slater-Usoh-Steed (SUS) methods. Through this study, we were able to identify a more suitable locomotion technology to expand the space given in the virtual reality on VR games, and believe that these data can be used in the stages for planning and main development of VR games. Interaction between humans and computers is one of the most important factors in VR research. Among them, researches on technologies used when a player makes locomotion on the VR are being conducted steadily. "A locomotion technology on VR is to detect with a tracking system the locomotion of the user who freely travels within the tracked area. " In particular, due to the nature of adventure games where the user needs to navigate their ways, it requires a large space to enhance player’s sense of immersion. Securing such a space is neither economical nor efficient. It is possible, however, to create an economical, efficient and immersive VR adventure game by expanding the space in the limited VR environment by applying a locomotion technology, in which we can find the rationale for the researches on locomotion technology when producing VR adventure games. In this paper, we will apply locomotion technologies using JS and TP, respectively, to Treasure Hunter – a VR adventure game that we created in order to experience a VR game with expanded space, and evaluate and compare their usability. JS-based control and TP locomotion technology supports locomotion and mobility of players on the VR environment. "Locomotion technology is an important component of virtual reality configuration and is a technology used to move a user's viewpoint in a virtual environment.” It is possible to expand the space with locomotion technology in VR games allowing the user to experience a virtual environment that is wider than the actual space. With the JS locomotion technology, the user can make locomotion by operating the touch pad. The TP locomotion technology allows the user to move instantly to a desired position within the restricted virtual points, as presented in the following Figure 1. The player can travel with these two locomotion technologies in the infinite space of virtual reality without actually moving, which indicates that the limited space can be expanded. The left side of Figure 1 is JS that allows to move any directions to upward, downward, left or right by manually adjusting the control button. The right side of Figure 1 indicates TP that allows to make an instant movement to a specified position. The player can move directly to a selected position from the current position by clicking on the touch button. Treasure Hunter is a Unity3D-based VR adventure game that we created. The background of the game is the inside of an Egyptian pyramid from which the player needs to escape after collecting jewel items avoiding the attacking creatures. The player first finds the list of items to obtain, collects all items on the list and then escapes from the treasure room. For the experiment two version of Treasure Hunter were produced using JS and TP locomotion technologies, respectively, as shown in the following Table 1. The left-side image of Table 1 was captured from the Treasure Hunter produced with the JS locomotion technology in which the player makes a movement to a desired position by adjusting the control button of JS. It allows the player to move any desired directions featuring high degree of freedom. The image on the right side of Table 1 was from the Treasure Hunter created with the TP locomotion technology. Player’s selection of a position among those set in advance during the production of the VR allows an instant movement, so that it is possible to save the play time. For the experiment, two version of Treasure Hunter – JS version and TP version were produced. Subjects consisted of 30 people who had an experience of playing VR games. The subjects were divided into two groups from which we collected data with respect to four major characteristics of virtual environment – sickness, immersion, user preference and user error through the experiment. In order to reduce differences in results caused by proficiency difference, both groups were presented with the instruction to the game prior to starting the experiment. The participants were requested to find items while avoiding monsters' attacks. The participants used locomotion technologies based on their spatial perception in relation to item collection, game space and judgement on attacking targets during the mission. Participants were requested to fill in a Simulator Sickness Questionnaire (SSQ) of Kennedy-Lyan before and after the experience. The SSQ filled in prior to participation can increase the reliability of the experiment because the conditions of the participants can be checked in advance. The participants were asked again to fill in a SSQ after completing the VR game and a questionnaire established based on the Slater-Usoh-Steed (SUS) elements. We drew results from the collected data. The questions of the questionnaire are presented in Table 2. Which did you feel more sickness when using JS and TP? Which is more immersive when using JS and TP? Which of JS and TP movement technologies is better? Which of JS and TP was useful to cope with problems? The questionnaire consists of four categories – sickness, immersion, user preference and user error, which were selected for the purpose of analyzing spatial perception and movement. According to the questionnaire and in-depth interviews with subjects, the sense of sickness was higher when using JS than TP. On the other hand, the JS method that allows the participants to make a direct control and therefore ensuring more participation in general, was given a higher point than TP in terms of the sense of immersion due to the nature of a VR adventure game. There was no significant difference in the user preference due to difference by each type according to the experience of participants, but TP was preferred a little more than JS. It was identified through the interview that result can be attributed to the emotional burden of participants to the sickness. In other words, the result indicated that participants reacted more sensitively to SSQ questions about sickness than sense of immersion. With respect to this, TP was give more points than JS in the questions about user error. In conclusion, participants felt more dizziness and sickness when using JS than TP. However, due to the nature of an adventure game, the preference for JS was higher due to higher sense of immersion and tension. However, TP was given more points than JS in almost all items except it. Through this, we have been able to realize that other locomotion technology on VR, which can reduce downsides such as sickness while retaining the characteristics of contents, is required. The points on the left side of Figure 5 were the result of t-test analysis of the difference between the averages of SSQ before and after the experiment. The used analysis method was SPSS 18 statistical analysis. The intensity of participants’ sickness was recorded in four-point scale (0 – No dizziness, 1 – Minor dizziness, 2 - Severe dizziness, 3 – Very severe dizziness). The total points were obtained by adding statistical points and the data points of JS and TP reactions were presented as the (M) value or the average value to provide the SSQ points. For the purpose of comparison, the standard deviation (SD) was also provided. In addition, the result after completing the experience was presented in five-point scale based on SUS questionnaire. This result can be presented by using the result of check items and SUS usability comparison method as shown in Table 3 and Figure 2. Fig 2. The y-axis shows the score and the x-axis the different locomotion techniques. In this paper, we created a VR adventure game and conducted a comparative analysis of the usability of JS and TP through an experiment. To do this, a pre-research on two different locomotion technologies – JS and TP was conducted to examine differences. The result was applied to an adventure game to analyze spatial expansion in the VR environment through locomotion technologies. We compared the usability of these two locomotion technologies through an experiment using the SSQ scale that can quantify the dizziness and sickness of participants and the SUS evaluation method that can evaluate the usability of the targets. The result showed that TP was given higher points in most categories but the direct control of movement using JS could enhance the sense of immersion and amusement due to the nature of an adventure game. These results can be used for producing more enhanced VR adventure games. Following researches will be focusing on the comparison between JS and TP by analyzing Redirected Walking (RDW) locomotion technology that allows spatial expansion, features less dizziness and sickness and enables the player to make a direct walking at will. Evren Bozgeyikli, Andrew Raij, Srinivas Katkoori, Rajiv Dubey, Point & Teleport Locomotion Technique for Virtual Reality , Austin, TX, USA:CHI PLAY '16, pp205-216,October 16-19, 2016. Evren Bozgeyiklia, Andrew Raijb, Srinivas Katkooria, Rajiv Dubeyc, Locomotion in virtual reality for room scale tracked areas, International Journal of Human-Computer Studies, 122, 38–49, 2018. Eike Langbehn, Paul Lubos, and Frank Steinicke, “Evaluation of Locomotion Techniques for Room-ScaleVR: Joystick,Teleportation,andRedirectedWalking”, In Proceedings of Virtual Reality International Conference (VRIC) Trans, April, 2018. Won T., Jung S. SPSS PASW Statistics 18.0 Statistical Research Analysis. Hannarae Academy, 2010, p. 427-432.